Grimaldi’s new sign also appeared in time for the holiday weekend, though the pizzeria isn’t open yet. 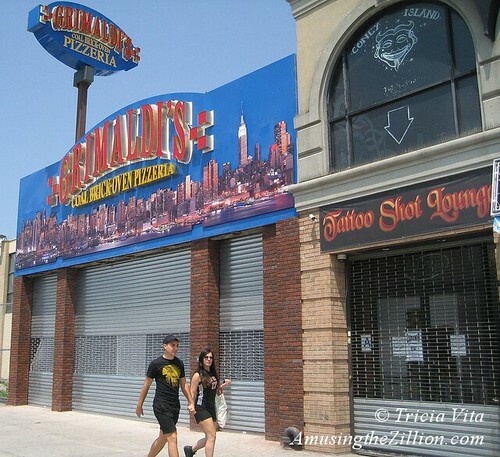 Located on the north side of Surf Avenue next to the Tattoo Shot Lounge, the opening of Grimaldi’s second Brooklyn location in the coming weeks is sure to set off a Best Pizza in Coney Island contest with Neptune Avenue mainstay Totonno’s. The two pizzerias are already longtime rivals for the title of Best Pizza in New York. Grimaldi’s, whose original location is under the Brooklyn Bridge, chose a New York City skyline for their sign. The new look for the Boardwalk includes lighted custom signs replacing much of the quirky hand-painted signage of recent decades. 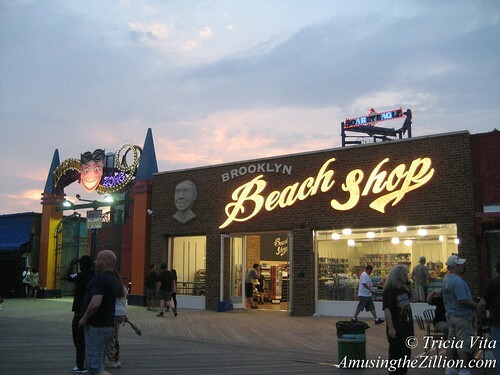 One of the Boardwalk’s new stores, the Brooklyn Beach Shop, is a shining example of the new Coney Island. Located between the entrance to Scream Zone and Ruby’s Bar, the glass-fronted storefront features custom brickwork and a 6-foot-tall stone Steeplechase face sculpted by Italian artist Mario Ambroselli. The piece de resistance is a classic bare bulb sign in script that says “Beach Shop.” The airy renovated space formerly occupied by Coney Island Souvenir Shop is filled with private label T-shirts and beach gear. Brooklyn Beach Shop also has roots in the past. The store is owned by Maya Haddad and her father Haim Haddad, who has owned and operated businesses in Coney Island since 1996, starting with Mermaid Horizons at Mermaid and Stillwell Avenues. 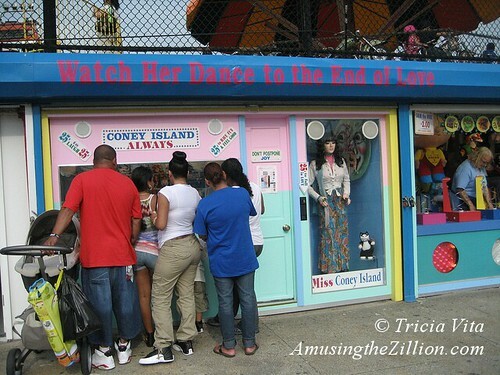 In 2002, Haim opened Coney Island Beach Shop on Stillwell Avenue behind Nathan’s. They also operate a second Coney Island Beach Shop inside Stillwell Terminal and the new Nathan’s Gift Shop on the Boardwalk. Memorial Day Weekend marked the return of go-karts to Coney Island’s Stillwell Avenue and the debut of a thrilling new ride on the Boardwalk. We snapped this photo of Coney Island Raceway’s new sign on the eve of the go-kart track’s opening day at the expanded Scream Zone. 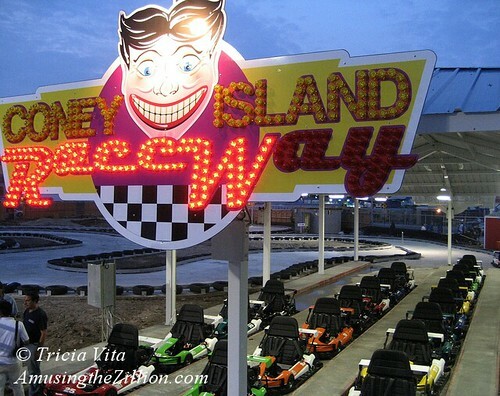 Go Karts were a popular attraction in Coney Island until 2006, when Thor Equities bought the Stillwell Avenue property leased by Batting Range and Go Kart City and evicted them. The second new ride to open this weekend at Scream Zone was the Skycoaster, a high thrill ride combining elements of skydiving and hang-gliding. It is already proving to be as much of a show as a ride with crowds gathering for the vicarious thrill of watching riders soar over the Boardwalk. Lola Star’s fashionably skinny boutique on the Boardwalk is crowned with a dazzling sign designed by the shop’s eponymous owner Lola Star aka Dianna Carlin. ATZ wrote about the sign’s upcoming debut several weeks ago, but this weekend was the first time we saw it illuminated and in action. 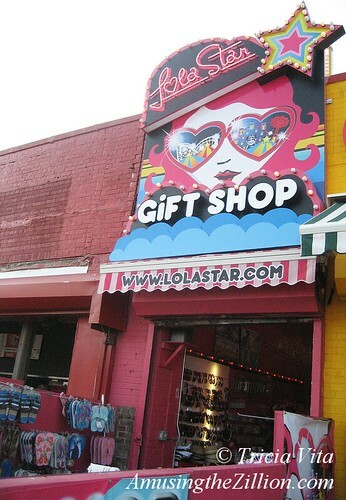 On the new sign, blinking white lights encircle “Lola Star,” which is pink neon, as well as the 3D clouds and the words “Gift Shop.” Says Lola: “In Phase 2 there is going to be a gigantic disco ball rotating on the roof with a 3D Lola Star on Roller skates standing on the disco ball!” Bravissima! The solar-powered lights on Deno’s Wonder Wheel debuted on Memorial Day Weekend! 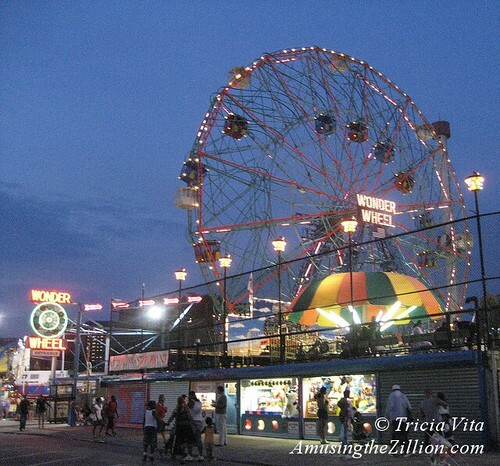 In this photo taken from West 12th Street, you can see the jewel-like lights on the corners of the Wheel’s Swinging Cars as well as the Mangels lights around the park’s perimeter and the Wonder Wheel’s vintage neon sign and row of new booths on West 12th Street. Installing solar panels atop the cars is a longtime project of DJ Vourderis, whose family owns the New York City landmark. The goal is to bring back the wheel to the way it originally looked when it opened in 1920. Though the perimeter and spokes of the Wonder Wheel were lit, the cars had been in the dark since the 1980s, when park founder Denos Vourderis removed the lights due to safety concerns over high voltage. The dancing mannequin “Miss Coney Island” and the miniature animated rides of “Coney Island Always” got some new lettering over their windows: “Watch Her Dance Until the End of Love.” Along with Skin the Wire and other games, the whimsical windows moved to West 12th Street this year after 14 years on Jones Walk. The new booths look more delightful than ever, but the old overhead signage had to be left behind since the new space couldn’t accommodate them. More new signage is in the works. Miss Coney Island’s motto remains “Don’t Postpone Joy” and it’s still only “25 cents to fall in LOVE.” She occasionally has more to say on twitter! As we reported last week, Paul’s Daughter and Ruby’s Bar opened their renovated stores on the Coney Island Boardwalk. We were happy to see the Mom & Pop businesses bring back some of their quirky old hand-painted signage. 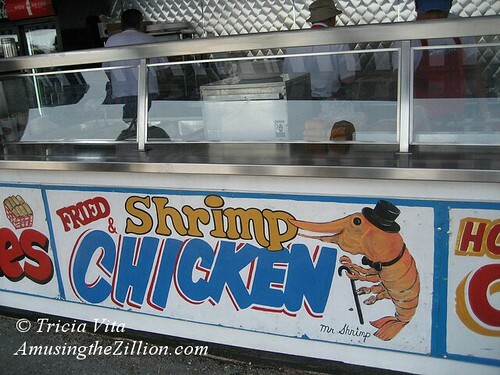 The popular favorites Mr. Shrimp, shown above, and Chiefito and Chiefita — the Nice N Sweet/Fluffy Cotton Candy Kids–were among the restored signs returned to the new facade of Paul’s Daughter. 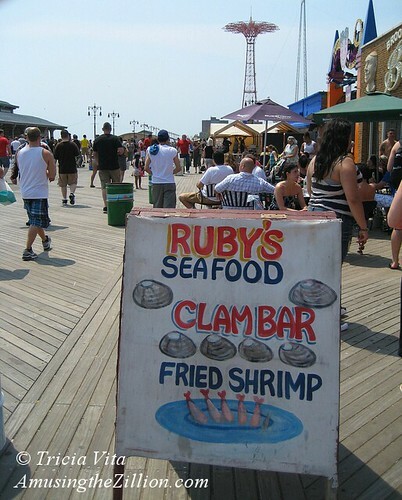 At Ruby’s Bar, the hand-painted sign advertising clams and fried shrimp was set out on the Boardwalk amid new tables and chairs. Along with the rest of Coney Island, both stores were packed with visitors over the Memorial Day Weekend. Cheers to a bright and prosperous new season! It is so nice to see Coney Island being restored with all new rides, attractions, signage and PEOPLE by the droves. It makes me so happy. When I was there is the summer of 2008, it was awful and very sad. I hope to return in 2013 for the opening of the B&B Carousell & Pavillion. Great article, Tricia. Thanks much. Diane H.
Great coverage, Tricia. Here’s to the new season. Excellent coverage, Miss T! Some crowds on Memorial Day, too. I will be so happy to see the B & B upon its return as well, and I hear that the Pavilion of Fun will start construction this fall on the Bullard lot! Did you hear that, too? I felt that Coney should stay in the past twntey years. I’ve always felt today’s Coney Island needs change in a big way. I’m not for the empty lots and furniture stores. I want to make sure that the change keeps amusements in Coney and not on a smaller scale. @440Gallery That would be nice. Then people would have somewhere to take shelter from a sudden rain! Great post & pics,, Tricia. It makes me happy to see Coney still thriving, sad for what’s missing or replaced, and hopeful that regardless of the current drama it will be a great place to play for generations to come. Always great reporting from ATZ. Thanks! Cool! What a great write-up, can’t wait! That’s wonderful to hear! Those bathrooms needed some improvement, but the rest of Ruby’s was perfect in every way. I don’t like to see the quirky, hand-painted signs going away, but glad that Coney Island is still thriving and that Ruby’s and Paul’s Daughter won their battle! I’m going this Sunday if weather permits. Great photos and reporting.